Over in Atlanta, a husband and wife team of architects lovingly designed and built a 7' X 10' garden shed for their garden tools and bicycles. "We knew that it would be visible from the street," Jeff Morrison says. "We wanted to add something to the streetscape." 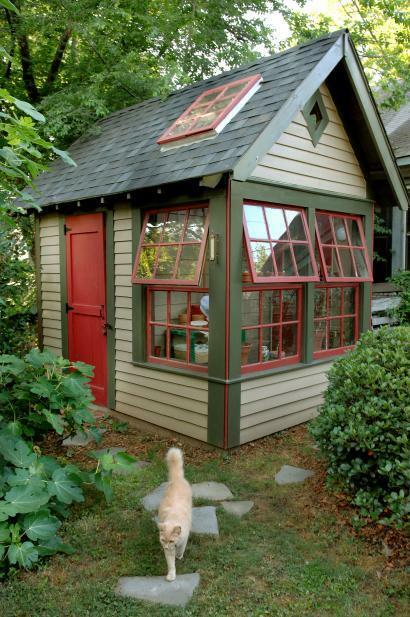 "Taking their cue from their 1905 Victorian cottage, the couple created a delightful little house that looks as if it has always stood in the corner of their vest-pocket backyard in Candler Park. It's the big, bold visions that usually get the spotlight in the history of city planning. But it's the small moves - even a....potting shed - that give a city its grain, texture and character. The Morrisons' project is among the little guys to get their star turn when the Urban Design Commission bestows its Awards of Excellence...."
What a gorgeous garden shed. What a shame more structures are not built to blend in with their environment. Who would have thought a garden shed would win a urban design award. That's looking nice among differentiate Shed.